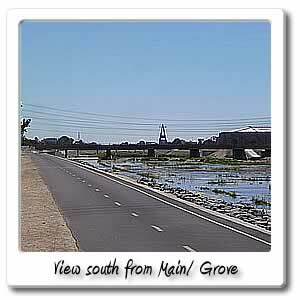 Welcome to Main Street on the Santa Ana River bicycle trail. 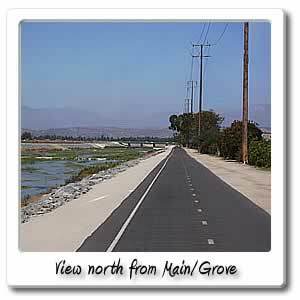 Going north for 14.6 miles on the Santa Ana River Trail, you will be on the way to the 15 mile marker, which is at the next entry/exit point on the Santa Ana River Trail at Batavia Street. 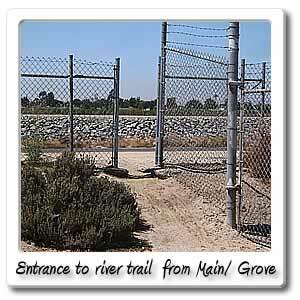 The Main Street/ Grove Avenue entry point, is a a section of fence, with an opening in it, that leads you through an industrial area, if coming off the Santa Ana River Trail. You will find this entry/exit point .3 mile and 1 minute from Ball Road. By going west on Ball Road, you won't find much, unless you go 3 miles, then there's the Village at Orange. If getting to that point, there all kinds of places for food by going north on Tustin Street in the City of Orange. You can find out more about this by going to the Ball Road page. If you go north 1.1 mile for about 5 minutes, you will come up to Lincoln Avenue, where there's more to offer. You can take a look at the Lincoln Avenue page to see what that entry/exit point has to offer.